TV Distortion Bundle consists of 5 plug-ins which can be used to create all kinds of distortions like LCD Matrices, digital glitches, chromatic aberrations, analog TV with bad reception etc. 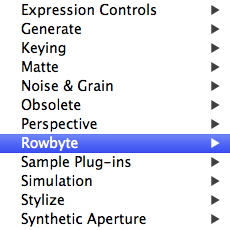 You can apply all the effects from the menu Effects > Rowbyte. All the plugins in the bundle draw a watermark, if not registered. To remove the watermark, you have to register the plugin with the serial you have purchased. 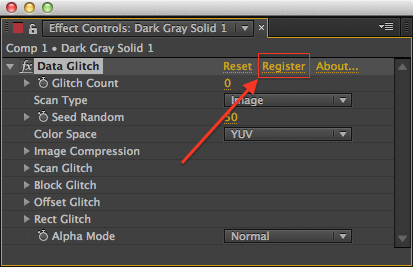 To register, click on the “Register” button in the effect controls window. All plugins are compatible with After Effects and Premiere Pro (CS5 & above). In After Effects, they support 32 bpc compositions (floating point) whereas in Premiere they only support 8 bit images. The bundle mainly consists of the following plugins.